Wild adventures are awaiting you at Wicked Jackpots with Wild Saloon Slot! It is a creation of Section 8 which consists of 5 reels and 40 paylines. You are taken to a saloon in the far west where you can meet lovely cowgirls and heroic cowboys. On the reels of this great slot, there are symbols like the Cowgirl, Beautiful Lady with a cigarette, Cowboy with a rifle, Man holding a Bottle and Cowboy with a Pistol. Begin your adventure at Wicked Jackpots using a PC, mobile or tablet! You can use the Up and Down arrows to adjust your bet on Wild Saloon Slot. When your bet is placed, click on the Spin button to begin. Combine at least 3 matching symbols to land a win on the reels. Also, make use of the Auto Play option to set 10, 25, 50 or 75 automated rounds which you can enjoy hands-free. Bet Levels: There are no bet levels on Wild Saloon Slot. Amount of Paylines Selection: The 40 paylines are all active and cannot be changed. Coin Values: Find bet values ranging from 0.40 to 480 units. Look out for the Cactus plant on Wild Saloon Slot! It is the Scatter which generates free games. Land 3 Scatter symbols on reels 1, 3 and 5 to earn 10 free games. When more Scatters appear during the round, the free spins are retriggered. If during this feature, a Wild shows up in a winning combo on reels 1, 2, 3 or 4, it expands to cover an entire reel, thus creating more winning possibilities. 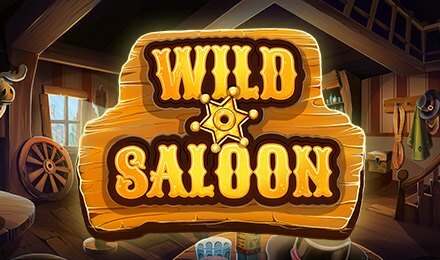 On Wild Saloon Slot, the Wild icon replaces all other symbols, except Scatter and Bonus to create a winning combination. With a minimum of 3 Bonus icons on reels 2, 3 and 4, the Bonus Round is triggered. During each of the 2 stages, choose one out of the 5 items to be awarded a multiplier. The total number of multipliers for the 2 stages are multiplied by your total bet. Don’t miss Wild Saloon Slot at Wicked Jackpots! While spinning the reels, follow the adventures of the cowboys and cowgirls.